I'm 78, walk my dog (she patiently waits while I shoot away) from 1 - 3 miles/day with my Canon 77D and 100-400 lens (old version) cradled in my arms for capturing birds. 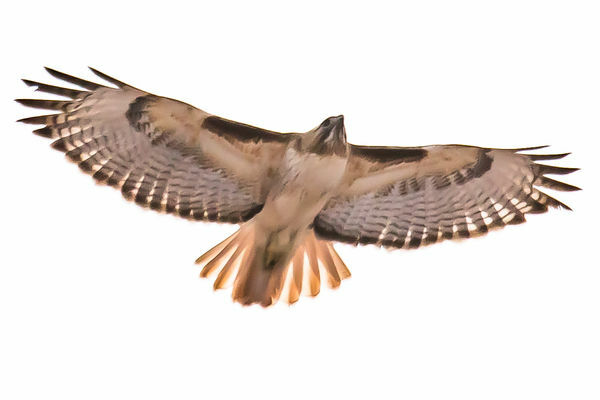 Looked up and saw this bird gliding over heard yesterday, hurriedly raised the camera, and took a few shots. ISO A, TV 2000, spot meter. PP PS, LR, yes a bit fuzzy. Pursuit of sharpness perfection allowed, overrated when luck is in charge. Good shot, you never seem to have the proper settings when out for a walk, you never know what is going to pop up. For such a common hawk they sure are beautiful as your fine photo shows. Beautiful and appears to have all of its' feathers as well which is not always the case with these birds when they spar with other creatures.